Seriously that must be nice to see. You should receive a fee every time it's taken out. I don't think it's much though. 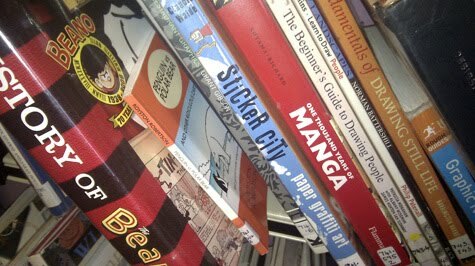 Not many people realise that libraries are a treasure trove for people interested in Comics and Graphic novels. I'm always picking up and trying books I wouldn't normally buy. So, if you don't already, go and support your local library by reading Comics and Graphic Novels for FREE!. Sounds like a hell of a deal to me. Ha, I know how it looks, Chris, but it genuinely was nothing to do with me! If it was I'd have made sure they bought the book from me (it was from Amazon, they print Lulu's print-on-demand books themselves and there's wording to that effect in the back of the book) as I get more money that way. 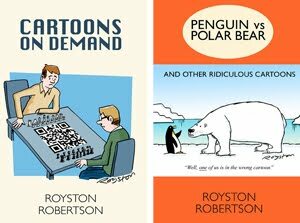 Yes, I'm already signed up for Public Lending Right, as a result of some books I illustrated for Scholastic some time ago, so I will add my book to the account. You're right that it's never very much but it's still money artists and writers entitled to. And yes, you're right about libraries. They're an under-used resource, though our local one is often quite busy, thankfully.